We’re not in Washington anymore! For five days we stayed with Amos’ brother Sam and his wife Lynné in Phoenix and Tucson, Arizona. During our stay we prepped gear and food for our first stretch of the PCT and hiked in Saguaro National Park, thanks to a stellar recommendation from a Triple Crown thru-hiker and employee at the local gear shop. Below are photos from the 8-mile trek to Wasson Peak (elevation 4,687 feet), on the ancestral lands of the Tohono O’odham people. We were very lucky to see the desert in bloom after an abundance of winter rain and snow. Here’s one of my favorites, the desert Mariposa lily. The day before the trail we experienced a bit of an unexpected adventure… Sam’s initial plan was for us to have a chill first half of the day in Tucson, and then at noon we’d drive from Arizona to California to camp 20 minutes from the trailhead. That would set us up for an early start the next day, our first day on the PCT(! 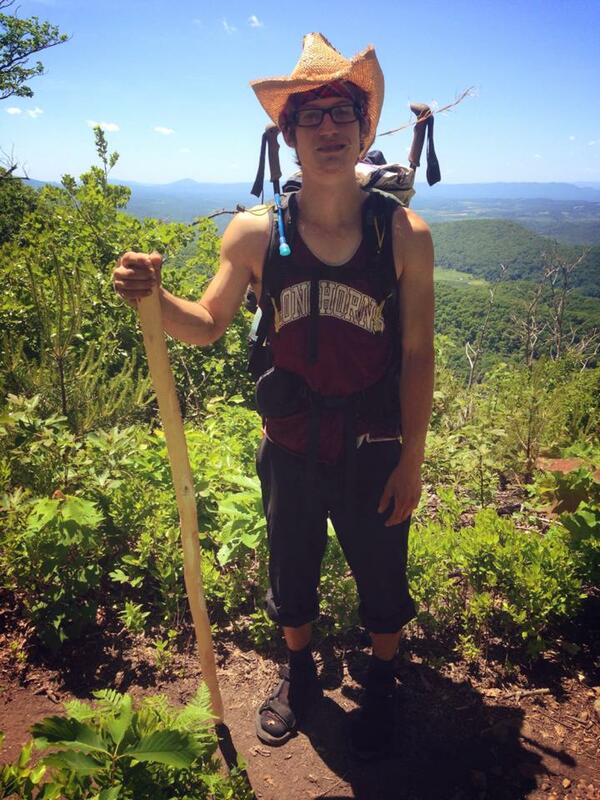 ), and Sam would get to see Scout – a trail angel he knows from thru-hiking the Appalachian Trail last year. Thankfully, we pulled safely onto the shoulder of the road just outside of Yuma, AZ. The brothers proceeded to change the tire in no time, putting on the spare with cool heads and steady hands. I observed in silence as the back of my legs baked in the sun. Once the spare was on, the car very obviously leaned to the right. We slowly made our way into Yuma for a quick stop to Target – to pick up much needed sunscreen – and then parked outside of a small Mexican restaurant. We went inside and ordered dinner while Sam called people, trying to figure out how to fix his car. In-between bites of taco, he called tire shops, dejected. Come to find out, the nearest shop, Wal-Mart, was going to close in five minutes- daaaaang. Guess we’re spending the night in Yuma. Long story short, after being rejected by a few places, we found a spot to camp at a nearby RV park. Yes, it was slightly sketchy – an older man did encourage us to visit “the pyramid tent” for some “good vibes.” But as you can see in the pictures, it was a pretty spot along the Colorado River. We were also quite literally a stones throw from California, too. While a peaceful place to chill in the evening, we got to experience a mockingbird sing all hours of the night from his perch… a bonafide bachelor pad… in the tree above our heads. From car alarms to squirrels to other birds, that kid could sing! What a boisterous and to be frank – annoying as hell! – little dude. I woke up at 1am thinking it was 5am because of the bright desert moon and this incessant song! Which means we all experienced horrible sleep the night before Trail. Though it all worked out well enough in the end. We arrived at Wal-Mart at 6:30am, got two new wheels for Sam’s car, drove the two more hours to Campo, California, and hit the trail by 11am! Woohoo! What a hot and sweaty first day, but boy do we look excited in our southern terminus pic! I’ll post more soon, but this will have to do for now. I’m currently typing on my cellular device, using one bar of LTE to update y’all. Tomorrow we’ll hike into town! 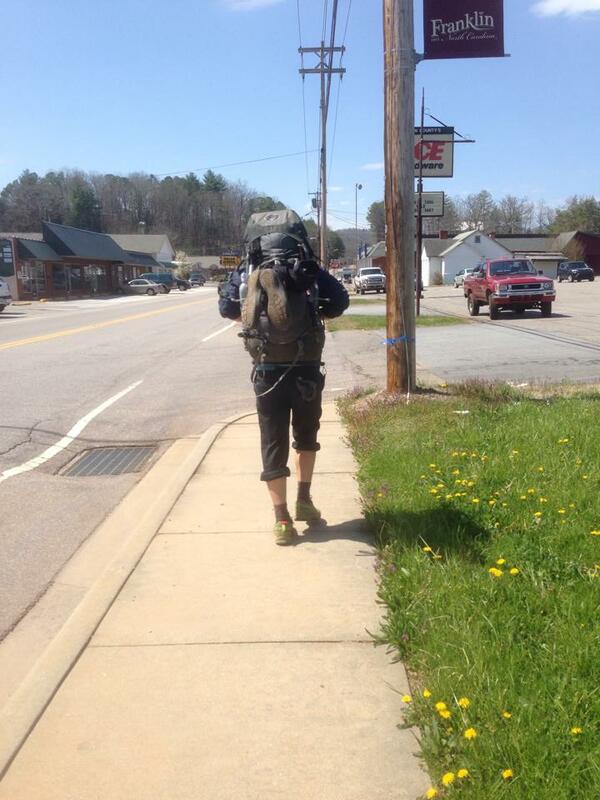 This post is a compilation of random tips, tricks, and gear advice that we believe is worth sharing to potential Appalachian Trail thru-hikers–or long-distance backpackers–who are on a budget. It’s the kind of stuff that Lucas and I wish we knew ahead of time. In total, we spent about $3,000 each (gear included). Hitch-hike, but be smart about it. Lookin’ completely hiker-ish with a purpose, aka not threatening to strangers. We stuck out our grimy thumbs at passing trucks from the get-go; since Lucas had already hitched around Europe, there was no hesitation. In the beginning, many hikers called up taxis or shuttles to pick them up. Up until Harper’s Ferry, the unofficial halfway point, we still witnessed people calling up taxis. That cost adds up! Most locals near the trail are aware of thru-hikers. They know that you need to resupply in town and want to help/like someone to talk to. If the driver doesn’t ask where you’re headed to within 30 seconds of saying hello, looks at you in a way that makes you uncomfortable, or has an open beer can in their hand, don’t get into the car. Try not to hitch alone, especially if you’re female. You are absolutely allowed to turn people down! Make up an excuse. Say you forgot something, or that you’re actually waiting for a friend. Stand by the road in a place where a car can easily pull-off. Take note if hitching is illegal in the area. Make fun signs like a big thumb, smile, or dance. Go to grocery stores. People will ask if you need a ride back to the A.T. If desperate, approach drivers at gas stations. Tell them your story. 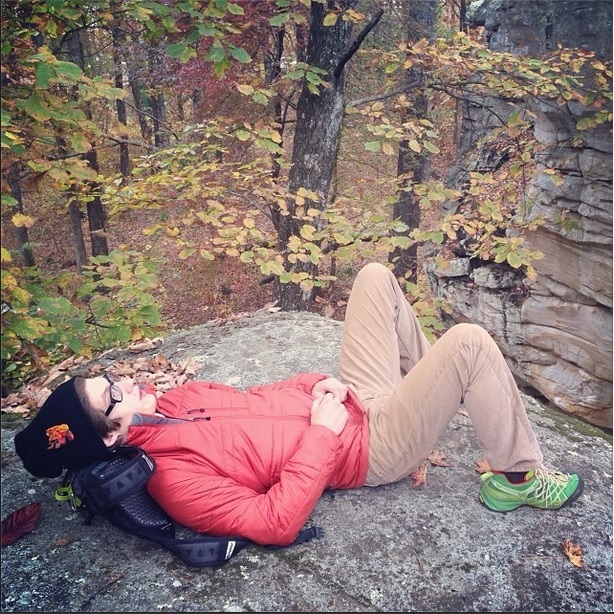 Unless it’s a jacket or shoes, don’t worry about hiking-specific clothing. Rockin’ the hand-me-down hat and thrift store tank. Instead, simply think synthetics and comfort. We both started with polyester shirts from Target, which we threw away after 700 miles and replaced them with thrift store shirts. Synthetics hold smell, bad. Even if you buy a name brand shirt, it’ll eventually smell like cat urine, so why not recycle shirts and support local businesses for $2? I sent my pants home early on and wore my long underwear under my shorts. It’s less weight, plus you have all the pockets you need. Check hiker boxes for gloves, hats, and even boots. Why pay to sleep somewhere when you can sleep in the woods for free? 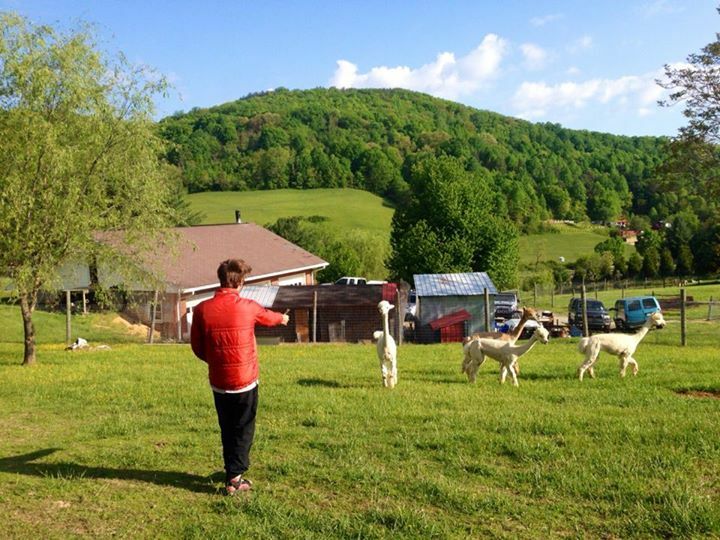 The morning after we slept in an alpaca barn at Four Pines. …or on the outskirts of town…or (with their permission) behind a local’s house? We stayed at hostels when all of our items were soaked or the owners were known for being awesome. If you’re in the mood to meet locals, download the app Couchsurfing and give that a go, or simply talk to people you see. If a hostel lists the price of every individual service in your guide book, beware. The nicest hostel owners (I encountered) have some sort of connection to the trail. They treat you like a human being not a profit, and then encourage you to leave donation. Keep an eye out for work-for-stay options. There’s potential to learn skills/apply ones you already have in exchange for a bed. It’s nice to be treated respectfully, so make sure to respect people in turn. If the hostel is donation-based, leave a fair donation. If someone gives you a ride to the trail and tells you their story about how they’re struggling, politely offer a few bucks for gas. Skip restaurants and hitch to the grocery store instead. Load up on both nutritious and calorie-dense food to eat right then and there. For us, it was impossible to come into town not starving, so we’d do things like split a rotisserie chicken, eat a spring mix of lettuce from the bag, bananas, fresh loaves of bread and hummus, etc. In cooler weather, load up on blocks of cheddar cheese; it keeps well for a few days. At times, Lucas and I ate a 1/4 lb. of cheese a day, and it was great. In New England, cheese that’s usually pricey ($4+) can be as low as $1.80. Mail-drops are worth it, if you have enough time to plan ahead! About half of our resupplies came from mail-drops, which were sent to not-the-best resupply points. When I made sure to vary the food, mail-drops were like Christmas. So yeah, keep them random and exciting! If you buy items in bulk, the mail-drop becomes worth it. Let’s say a box is $15 to ship, and you have 10 clif bars in it that you bought at $.80 each and a huge jar of almond butter for $7. Already, you’ve saved at least $15 versus buying it at the store off the trail, and you still have a box to fill with more items bought at discounted prices. Check-out Baltimore Jack’s resupply guide. It’s on point. If the mail-drops are overly planned and mostly the same, you’ll end up ditching their contents in a nearby hiker box. Stick mini candies in all the box’s empty spaces, except butterfingers because the texture changes. It’s nice eating the (healthy) food you like, especially when the only resupply option is a convenience store. Have lot’s of Ziplocks at all times. In the near future, I’ll make an in-depth post specifically about gear, but for now, I hope this helps you with your planning! After a bit of research, we both ordered our first pairs. 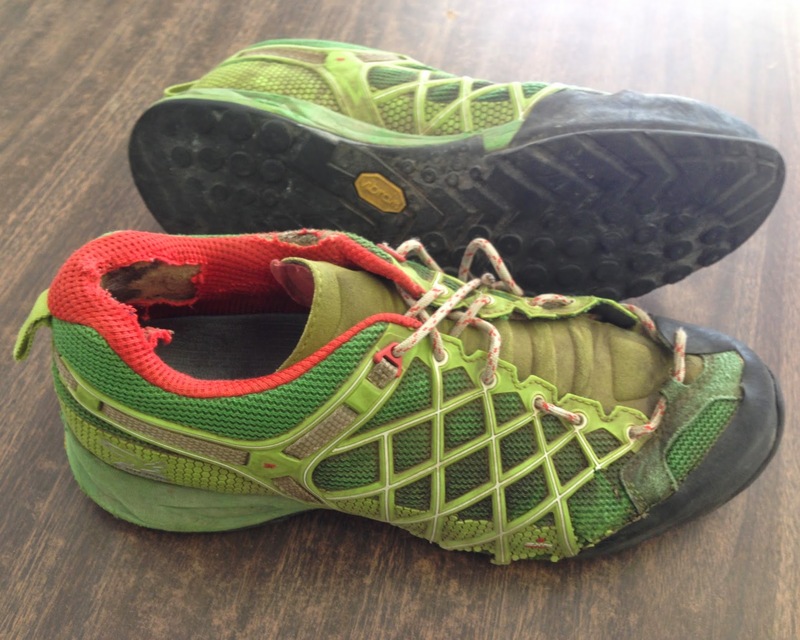 I figured the shoe’s design would function well on the trail’s terrain and, long story short, it does. Although the Wildfires are an approach shoe, their sticky rubber, stiff sole, and unique ankle design serve well for long distance backpacking through tough terrain. There are many sections of the A.T. where scrambling up and down rocks is necessary, and the Vibram Tech Approach EVO sole gripped those rocks with no problem. As a rock climber (and shorter person), I appreciated the rubber toe box a lot. Instead of being forced to lunge up a section of rocky steps, I could find little toe chips and pockets to use as intermediates. The sticky rubber also allowed Lucas and I the chance to slip off our packs and climb up boulders we saw along the trail, which is something you can’t do in a pair of traditional trail runners! They perform well on steep or uneven terrain, rocky descents, snow, dirt, and just about anything else. However, we did experience some slippage on mud and slick rocks, but I believe that becomes unavoidable to some extent. We purchased the shoes without Gore-Tex, and they dried overnight when laid sideways, which is important for a rainy Appalachian Trail afternoon. Lucas went the entire time without getting any blisters, giving credibility to Salewa’s “100% blister-free” claims. I, however, did acquire a tiny blister on one of my toes (it went away overnight though). Many people use high-top boots on their hikes for the ankle support. During research, we came across theories that claimed the high-top ankle support actually weakens your body’s natural ability to stabilize itself. Since we have gone as far as we have without twisting an ankle (knock on wood), I’d say the ankle support in the Wildfires was enough. For six months, Lucas wore his Wildfires as his everyday street shoe. He was obsessed with the fit from the moment he took them out of the box. During our thru-hike, the shoes felt right, as if everything was how it should be in a shoe and the toe box was wide enough. That is, until our feet swelled. 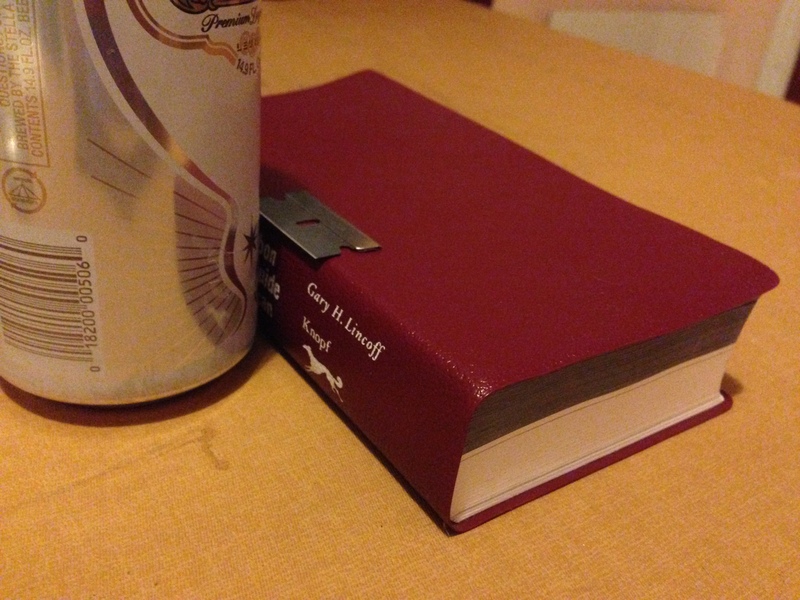 I made the mistake of ordering only a half size up–big mistake! I encourage you to buy a full size up from your street shoe if you intend to hike over 100 miles within a short period. Feet swelling and collapsed arches are inevitable when long distance backpacking! Thankfully, the Wildfires are laced similar to climbing shoes, and extend far towards the toe. Again, buy your shoe that extra size up and just tighten the laces for a secure fit. Both Lucas and I found the customizable insoles interesting, but I admit that I did not take advantage of this feature because I used my own super stiff, replacement insole (which I regret). The MFF+ Footbed system is definitely something to play around with and use to create the best fit for your foot. The wider insoles and extra cushion in the heel options will help with foot swelling. We ended up re-lacing our shoes 500 miles into the A.T. because our feet widened too much. Note: this strange method does allow the shoe to widen, but it doesn’t take advantage of the Wildfire’s unique lacing. It’s not uncommon to see torn up shoes on the A.T.–seriously. Many thru-hikers sport duct tape on their shoes, or have a couple of toes hanging out the front. So, although parts of our shoes began to fall apart, there wasn’t much functional damage. 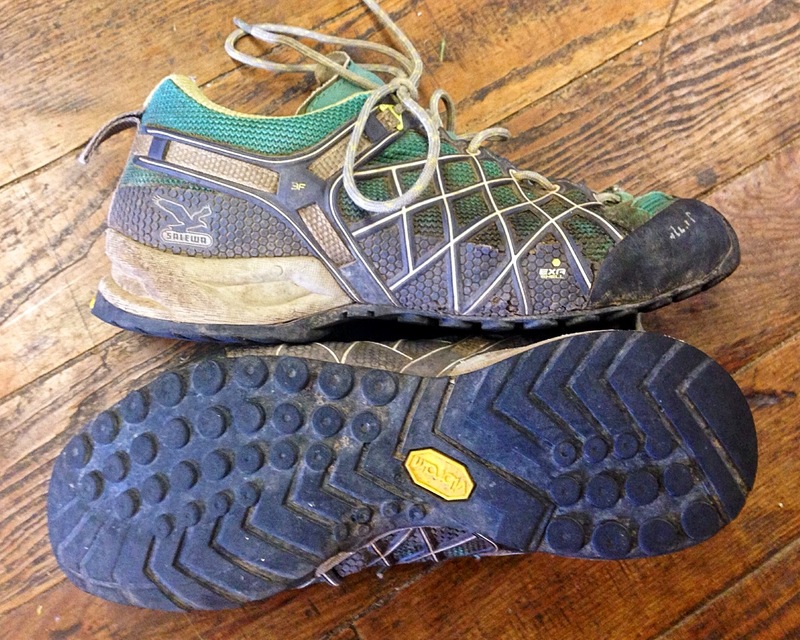 Nothing that would hinder our hiking ability changed; there was no real tread wear and the toe box maintained its edge. I’m absolutely impressed with their durability! The shoes only became less aesthetically pleasing with time. The first thing to show wear was the EXA shell that covers the bottom sides of the shoe–pieces of the beehive-like plastic began to fall off about 200 miles into our thru-hike. Next, we noticed the back and the sides of our ankle support wearing down to expose the inner foam. Luckily these changes did not effect the feel of our shoes–in truth, my heels couldn’t tell the difference. The rubber never separated from the outer fabric, and there are no holes either. These shoes are absolutely superb/I highly recommend them. Wear them during a section hike, take them on a climbing trip, or sport them around town–it doesn’t matter, you’ll fall for their magical powers. If you plan on using them for a thru-hike, UP-size and enjoy! 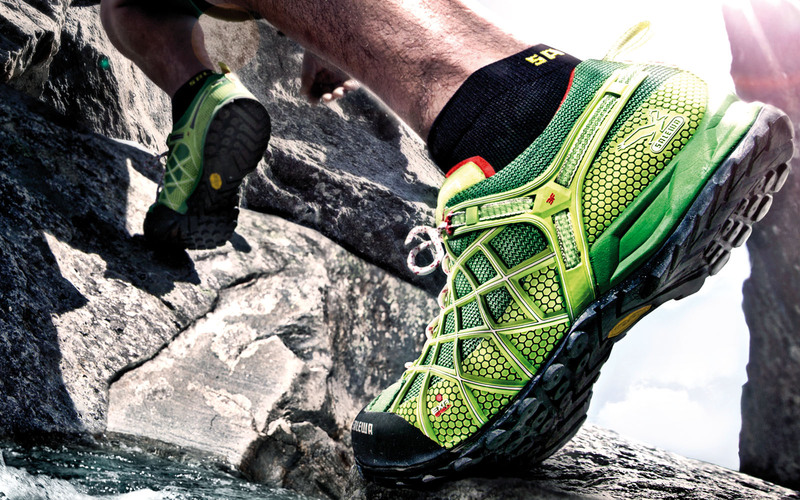 The quality of the Wildfire’s design and durability is suited for more difficult, technical hiking. This shoe makes a huge difference when scrambling over rocks. No joke, fellow hikers were envious of our gripping capabilities and asked to try on Lucas’ pair. In the end, I wore my shoes for a little over 600 miles, and since Lucas wore his for 6 months before the trail, we guess his accumulated mileage is near 1,000. If we would have sized properly, I’d say the shoes could have easily handled 1,500 miles. Soon, we will be sporting new pairs of Firetails, which are the next model up in stiffness. We plan on walking in them all the way to Katahdin! 3 weeks from now, Lucas and I will be camped somewhere along the trail! 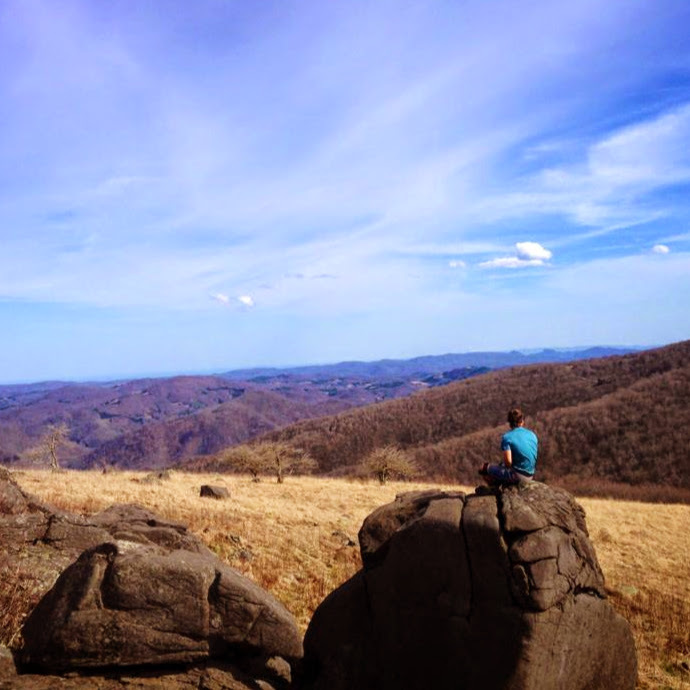 I look forward to the end of the planning process–I can’t wait until we stand atop Springer Mountain, prepared and ready for 5 months in the woods. It’s kind of stressful balancing calories per gram…and my checking account. 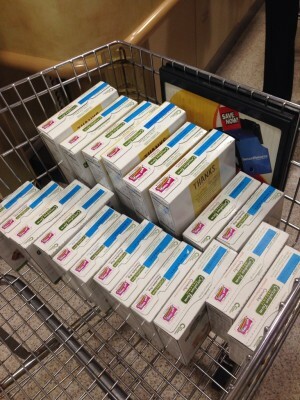 As of now, we plan on resupplying from 18-20 mail-drops (and buying the rest from grocery stores). There are plenty of outfitters, hostels, and post offices along the Appalachian Trail that will hold our packages until we make it to town. We have chosen to mail food to ourselves when resupply stores are inconvenient. Also, we want to eat clean food during our thru-hike, and buying ahead of time has allowed us to stock-up for cheap from Sam’s Club and Trader Joe’s (amazing deals for organic/natural options). Below are pics of our current food endeavor: preparing homemade trail mix! Right now, Lucas is rationing out 3-5 days worth for each pick-up. Walnuts, pecans, dark chocolate chunks, cranberries, goji berries, coconut flakes, and dried mango. Sesame sticks, walnuts, almonds, dried mango, cranberries, and sunflower seeds. Walnuts, pecans, almonds, chocolate chips, sunflower seeds, golden raisins, cranberries, dried cherries and blueberries. Walnuts, almonds, dried mango, wasabi peas, and chow mein noodles. Almonds, cashews, dried pineapple, cranberries, golden raisins, cherries, and blueberries. There are three easy steps to making simple, semi-raw mixes. Buy nuts, dried fruits, and whatever looks delicious/high in calories. Chow Mein noodles are a surprisingly good touch to trail mix. And dark chocolate is always a good idea. Get a brown paper bag, pour the above into the bag, and then shake it. If you want, you can measure out each ingredient to the right amount, or just eyeball it like I did (I added nuts and what not until the mix looked like the stuff you’d see at a store). Measure out servings and then package it in ziplocks or vaccum seal bags. Lucas will have approximately 3/4 to 1 cup of trail mix a day and I’ll have 1/2 to 3/4 cup. We’re not sure how many calories are in each serving, however, most of the ingredients are 5+ calories per gram…so that’s about 750-950 calories a cup. EASY PEASY and cheaper than buying premade mixes! 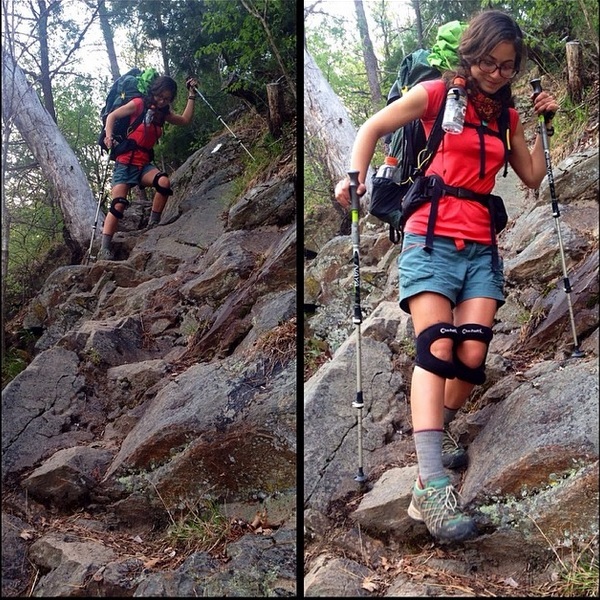 On average, Appalachian Trail thru-hikers burn about 4,000-6,000 calories a day. Our goal is to eat the amount of calories required, as well as pick the most nutritious, calorie-dense, delicious, and affordable options. We’ve also decided to schedule mail-drops rather than purchase our food from local grocery stores, mainly because it is cheaper to buy in bulk/ahead of time (in small towns off the trail, a pack of Ramen can be $1 a pack!). 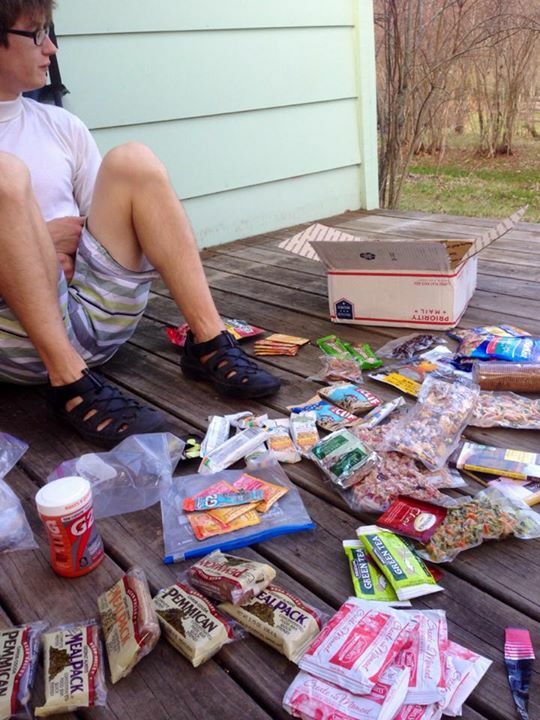 I admit, it has been slightly overwhelming to plan our food for the next five months–who knows how long it will take for us to tire of trail mix–but I believe that variety is key to a happy hiker stomach. After reading the NOLS Cookery book and various websites, I have determined that I will require approximately 4,000 calories a day, while Lucas needs about 6,000. I have also concluded that a diet consisting of 50% carbohydrates, 35% fat, and 15% protein is ideal for our daily hiking mileage and trip duration. Fat is the most calorie-dense food, so a diet high in fat allows us to reduce our pack weight while maintaining our high calorie count. It is important for us to be aware of our consumption of non-nutritious foods while thru-hiking. Although Poptarts provide a high amount of carbohydrates and fats, they do not contain sufficient nutrients and minerals needed to function optimally (not to mention, they’re highly processed). Therefore, we will take a multivitamin, carry Emergen-C packets, and try to eat as healthy as possible. organic bars, 4 cal per g, and just 41 cents a bar! Using this formula, I have determined that I will eat 1lbs (454g) of food for lunch and snacks, 0.1lbs (45.4g) of drink mixes, 0.5lbs (227g) for dinner, and 0.1lbs (45.4g) of desert every day. Phew! Now that the math part is out of the way, next time I’ll discuss the actual food we will carry. 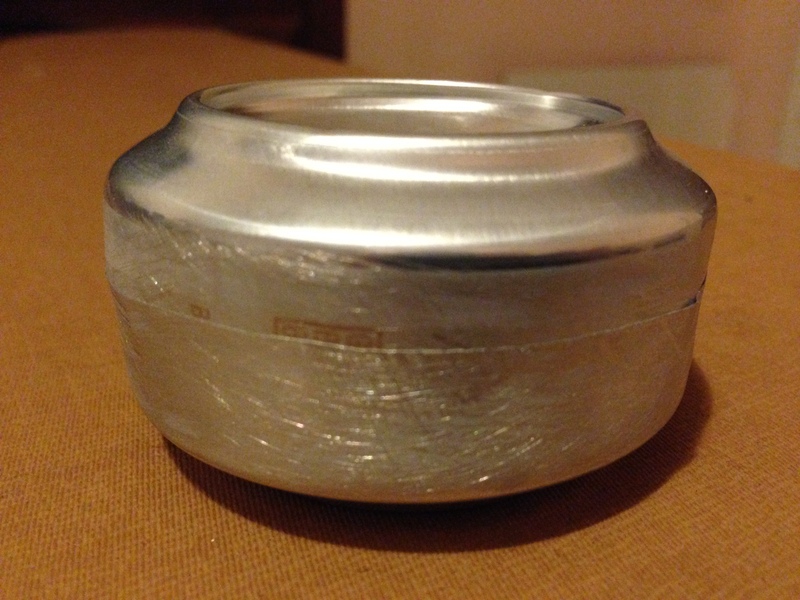 Instead of dropping 50+ dollars on a camp stove, Lucas and I decided to make our own from two aluminum cans. We will use denatured alcohol for fuel during our Appalachian Trail thru-hike. Alcohol burning stoves are cheap, ultralight weight, and just as reliable as a store-bought stove. Our stove will be used primarily for boiling water to rehydrate dehydrated food. From our tests, we have concluded that it takes less than five minutes to boil 500 mL of lukewarm water. Here’s a step-by-step guide on how to create your own! 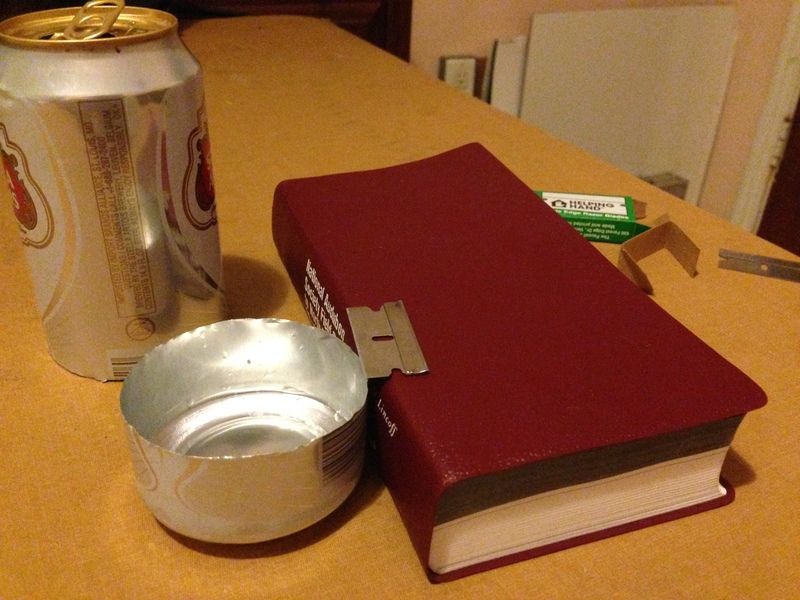 Use a book (or something sturdy) for a constant height to score the can with a razor blade. Once you have scored the bottom, you puncture the can along the score line and then press along the edge of the line until the bottom separates. 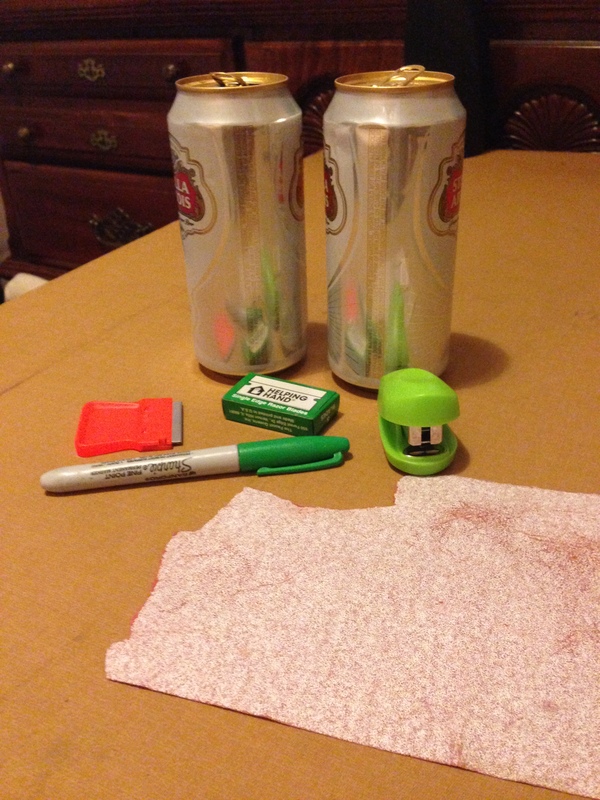 If the can does not tear apart easily, use the sharp edge of the razor to CAREFULLY cut along the score line. 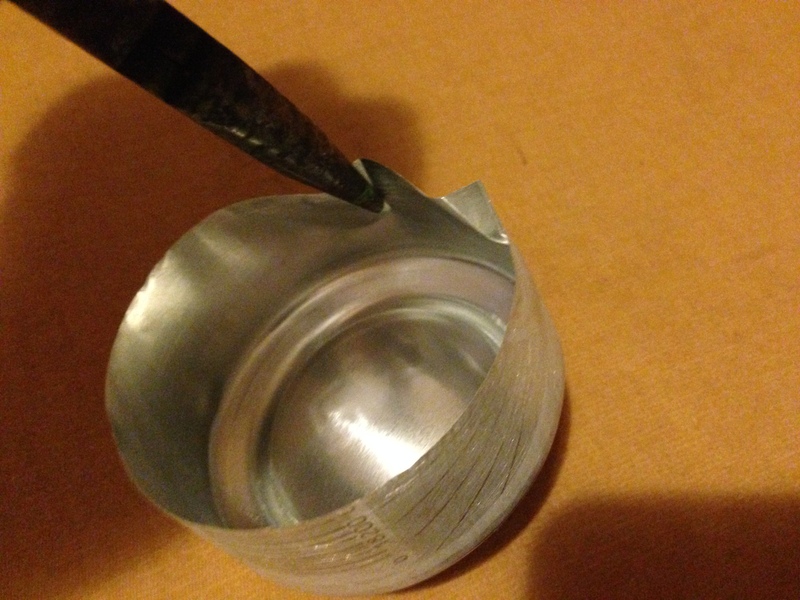 This will dull the blade greatly, so make sure you have backup razors if you choose this method (I used one blade for each can). Do this with both cans, use whatever height you feel necessary, but keep in mind that the final stove will be a little taller than your cut lines. When the cuts are done, sand the sharp edges for safety (newly cut aluminum is VERY sharp). 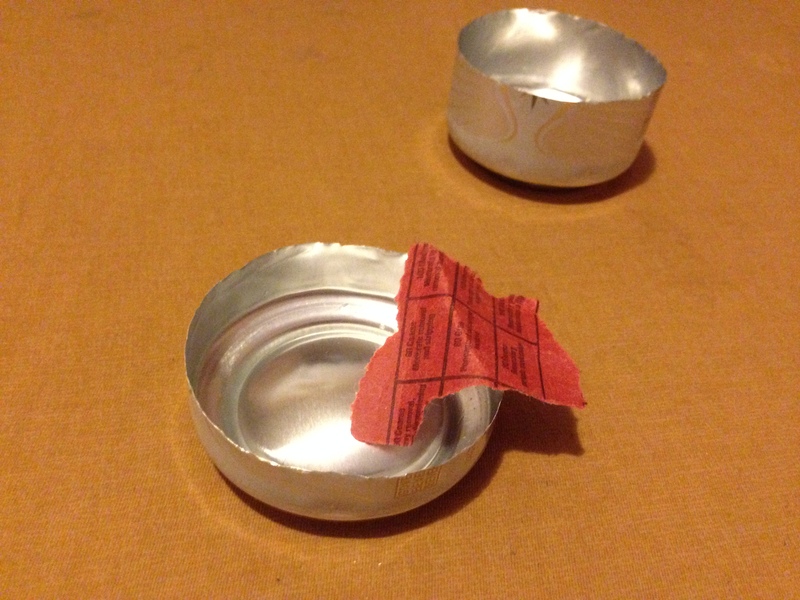 If you want your stove to have none of the can’s labels, sand the sides of the two cans. Choose one can to be the top of the stove, and set the bottom portion aside. Score the top portion of the stove along the concave part of the can. This sounds difficult, but if you score at an almost horizontal angle, it makes the cut a lot easier than you would expect. 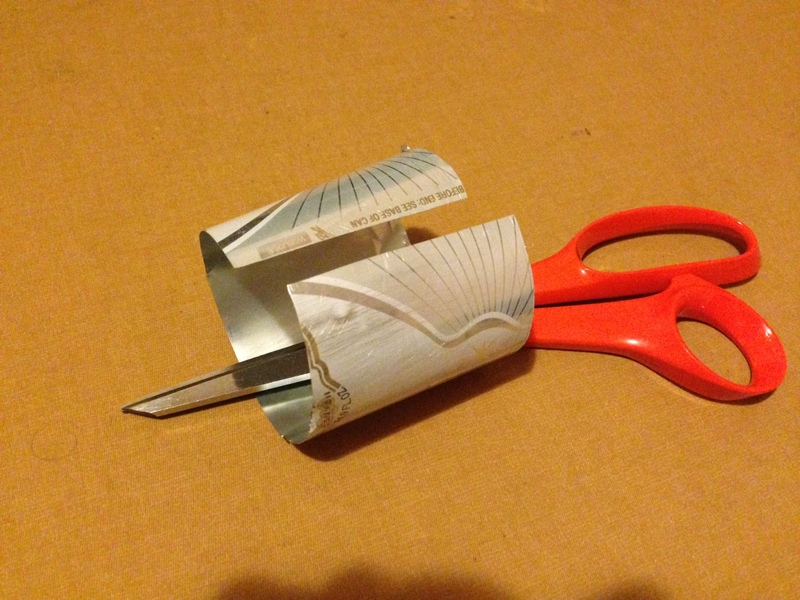 Now use the point of the scissors to press the score line until the top pops out. 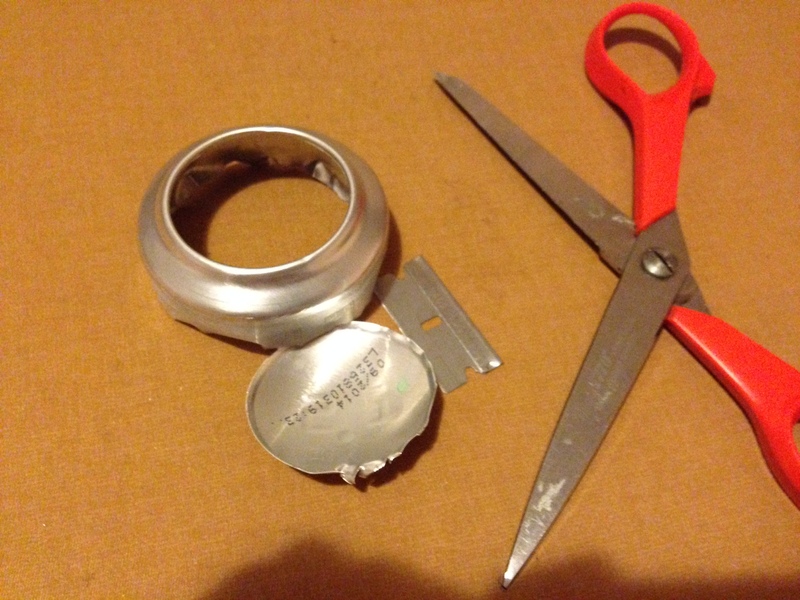 Take the remnants of one of the cut cans, and cut a wide strip of the aluminum off. This will be the inner lining of the stove. Measure and trim the strip of aluminum so it will fit into the grooves of both the top and bottom portion of the stove, and staple the strip into a ring. 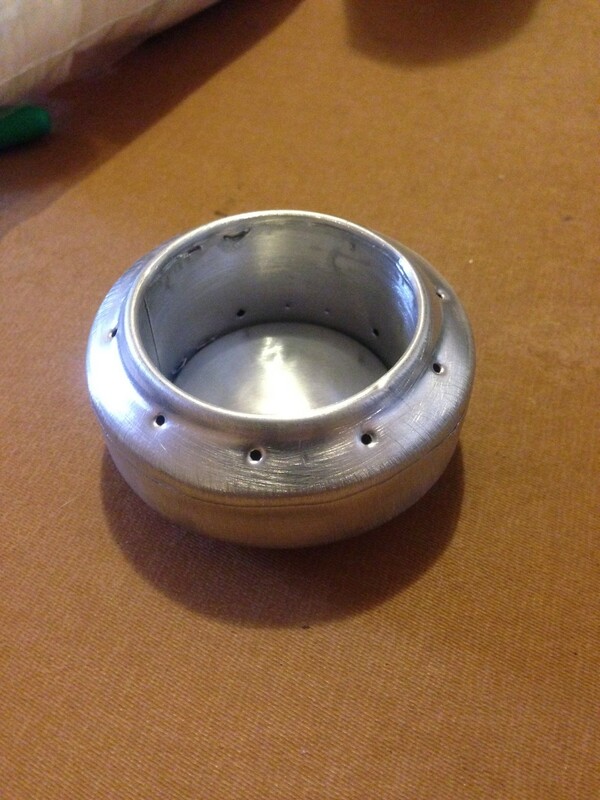 After the ring is measured and stapled, cut small “windows” on the bottom of the ring so the fuel will be able to move throughout the stove once it is completed. Take your pliers and make slight twists on the edge of one portion of the stove so that it will fit into the other portion. Here comes the hard part–try to fit the ring made earlier into the grooves on both portions of the stove while slowly pushing one section into the other. 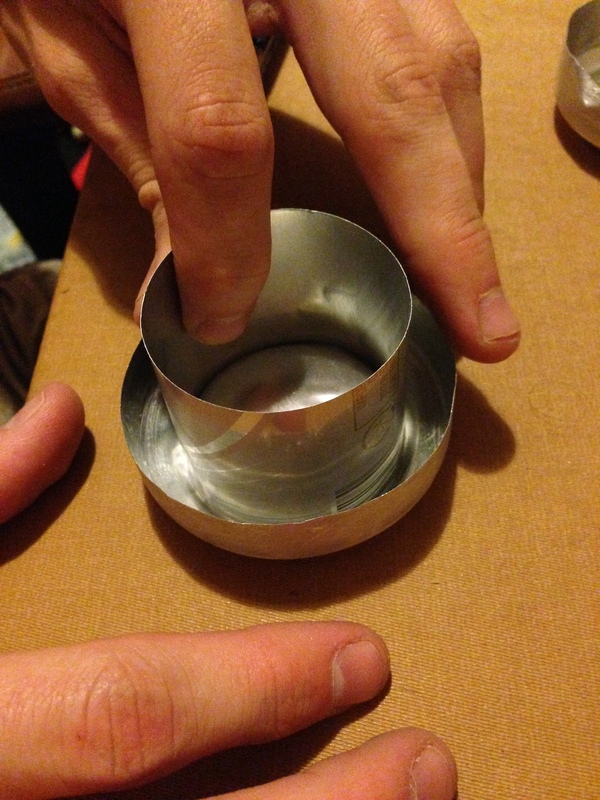 You may need to use your pliers to bend little bits out of the way so the ring will fit right. If done correctly, the lip of the top portion of the stove will cover the edge of the ring. Use a small nail (or push pin, thumb tack, etc.) to puncture holes into the top portion of the stove. You can use a piece of tape to measure the circumference of the stove and make tick marks at constant intervals along the tape to have holes that are equal distances apart from one another. I didn’t do this, just eyeballed the holes and punched away. And that’s our final product! 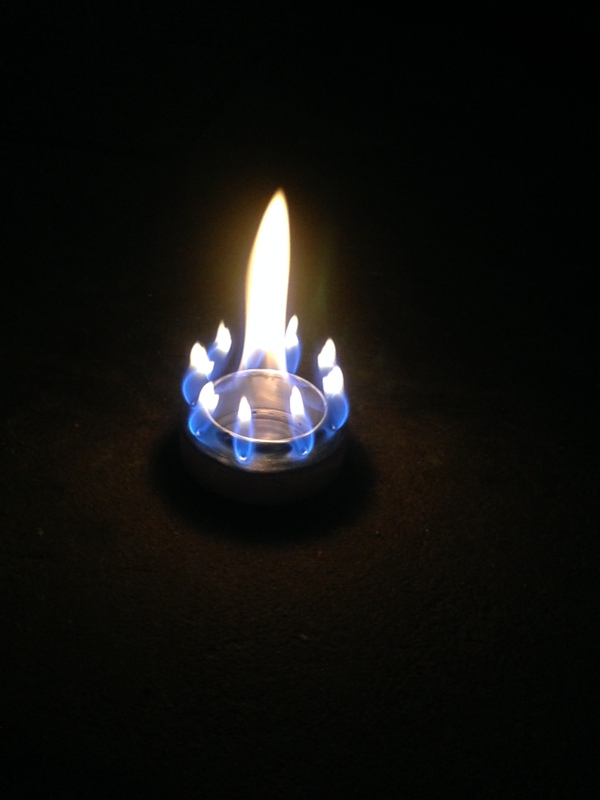 Now pour about a half-inch of denatured alcohol, light the fuel with a lighter or match, and there ya go… a fully functional stove. Use a pot-stand to make sure you don’t snuff the flame with your pot. We made our original one out of an aluminum grill screen, but it started to melt (whoops). Our next pot stand will be made out of good ole chicken wire.